Most of us are familiar with the story of Mary and Martha. We can be pretty critical of Martha, but I kind of like her—maybe because she reminds me of myself sometimes. 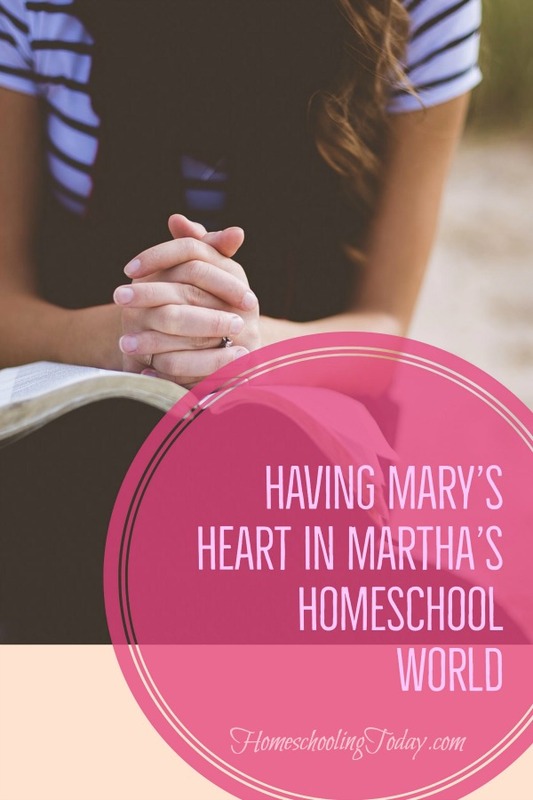 When we read about Mary and Martha, we often focus more on what Mary did right and what Martha did wrong. But that isn’t the complete story. So what did Martha do right? She begins by welcoming Jesus into her home. After Martha welcomes Jesus into her home, she serves Him—a difficult task considering the lack of modern conveniences when it comes to meal preparation. And yet it seems that serving Jesus is what she made her priority. Do we think of homeschooling as an act of service to Him? We sometimes forget the verse that says, “In whatever you do, do your work heartily as for God rather than for men.” (Colossians 3:23) How would our attitudes change if we realized that our “work” is for Him? Whether homeschooling, cooking, or cleaning, it can be done for the Creator of the Universe. Doesn’t seem as mundane when you think of it that way—doing laundry as an act of worship! Another thing I like about Martha is that when she gets upset, she talks to Jesus about it. How often do we get really honest in our prayer lives? Do we go to Him—even when we are messy—and tell Him how we are feeling? 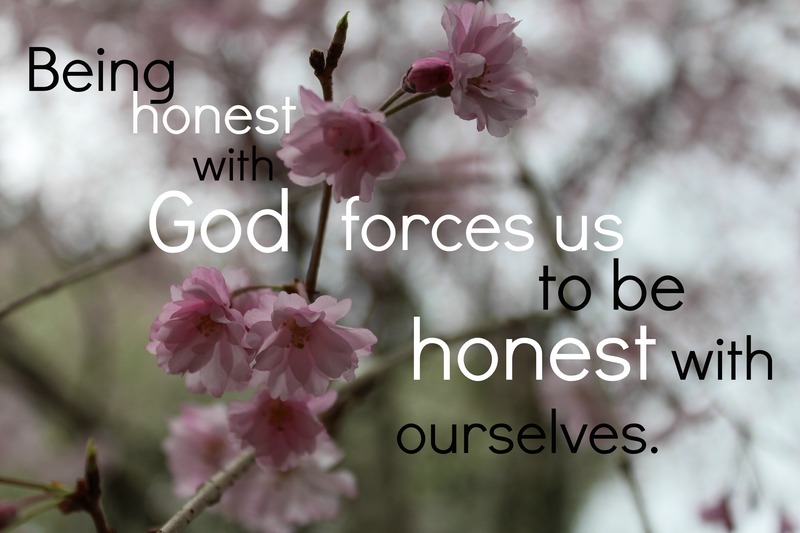 Being honest with God forces us to be honest with ourselves. But Martha did have some problems, too. She lost her focus on why she was doing what she was doing. It says she was distracted with much serving. Distracted means to be over-busied, to wheel about. However just as Jesus did with Martha, Jesus graciously, kindly points us to remember what is most important. So how can we keep our focus on Him, even in the midst of our busy homeschooling days? During busy seasons of our lives, time with our Father may look a little different. We may need to get creative. In our Moms Group at church one of our “Wise Ones” (the older ladies who have already raised their children) once suggested to the mothers with young children to write verses on index cards and place them in areas we spend a lot of time in (the kitchen and laundry room come to mind!) We can leave devotionals around the house where we will see them and pick them up at various points of the day. Or we can spend time studying His precious love letter to us—His very words—while our kids are doing their silent reading. If you have young ones who don’t take naps, but aren’t reading yet, you might consider giving them some “room time.” We instituted room time when our boys quit taking naps. They had to spend an hour doing quiet activities in their rooms like looking at books or listening to a story on tape. But whatever you have to do, find a way to spend some time with your heavenly Father! Get to know Him and His character, so that when things are difficult, or hectic, unlike Martha you can rest in knowing He does care. In order to nurture our relationship with God, we strive to stay connected to Him through personal study and prayer and by developing and nurturing relationships with other believers that encourage us. Part of staying connected to God is the time we spend worshiping, fellowshipping, and learning with our church family. Because of this we make church attendance a priority, and commit to serving in our church and being a part of a Bible study. Since our second priority is our relationships with one anther, we concentrate on relationships above academics. Notice I said above academics and not instead of academics. Education is very important to us, but our relationships are more important. I’ve often heard mothers say it is difficult to be both their children’s mother and their teacher. I do understand what people are saying, but I have found that changing the way I think about my roles of teacher and mother has helped. I am always their mother. Period. Yes, part of my responsibility as their mother is to educate them, but my relationship does not change based on whether I’m reading to them, showing them how to do a math problem, telling them to clean their rooms, or playing a board game with them. And since I am their mother, a major part of educating them is helping them to understand their identity in Christ, that God created them with a purpose, and that education helps them to be ready as they discover that purpose. Comparisons can be distracting, too. How? When we compare ourselves, our kids, and our homeschools to others, we often make choices that we might not make otherwise. We see all the things others are doing and fear we aren’t doing enough so we sign up for another music lesson, co-op class, or sport. Or we worry that our student isn’t doing as well as others in some academic area so we begin adding “supplements” to their already full days. But the problem with comparisons is that we end up making other men our standard instead of God. Once again we’ve lost our focus. What if we went to Him before we signed up for activities, events, and classes? What if we asked Him for wisdom in how to teach our children in the way that is best for them? God wants us to sit at his feet and listen to His teaching, because He loves us. He created us and knows just what we need. He desires to be the source our our strength, and to lead our homeschools. May we take time to sit at His feet and hear.